One of my favorite automobiles is the Auburn Boattail Speedster manufactured by the Auburn Automobile Company of Auburn, Indiana. 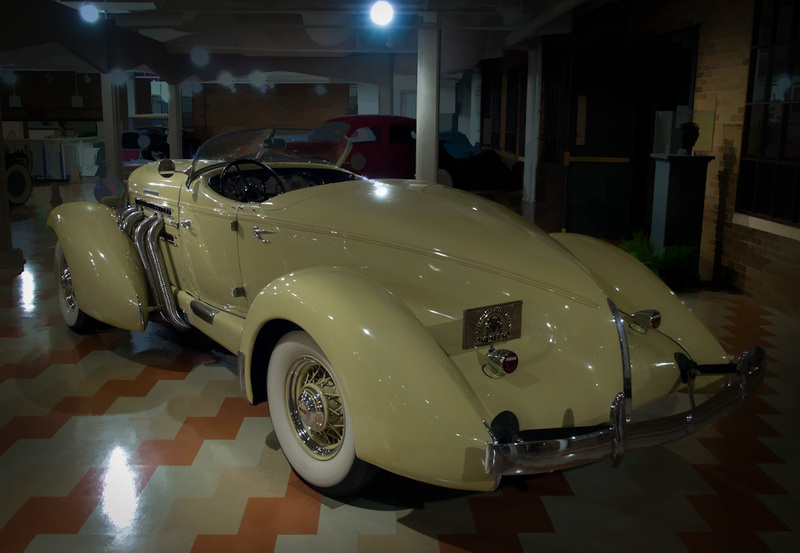 The Auburn company was sold to E.L. Cord who merged it with Duesenberg to create a company which manufactured Auburns, Cords and Duesenbergs. Their main facility was housed in an Art Deco building in Auburn, Indiana which now houses the Auburn-Cord-Dusesenberg museum. 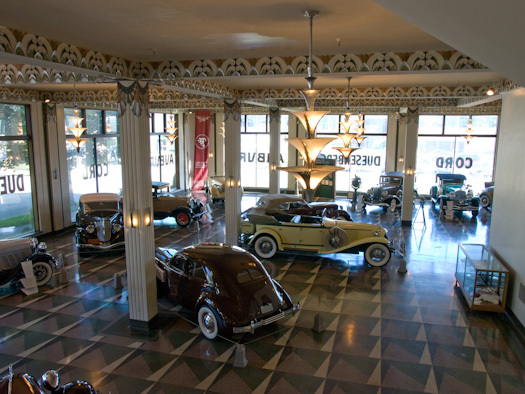 This shot shows the showroom of the Museum, displaying an array of vintage Auburn, Cord and Duesenberg automobiles (big surprise). The showroom has some great Art Deco touches such as the chandeliers, and detail work in the ceiling, flooring and main staircase. 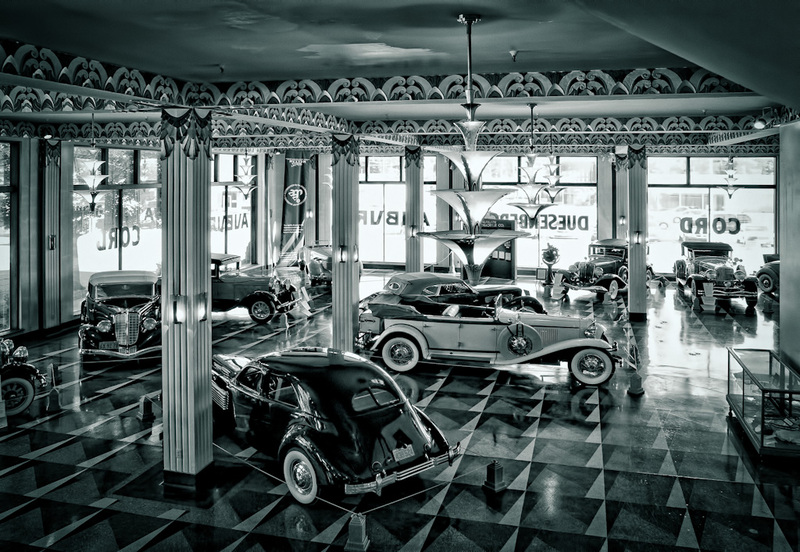 The museum is a great place to visit if you love vintage automobiles or enjoy Deco design. This image comes from a series of three that I had originally taken with the thought that I might use for an HDR shot. I didn’t have a tripod with me so this was shot using the railing of the staircase for support. I did run the images through Photomatix, but I didn’t like the look. Instead, I use a couple of Photoshop plug-ins to get a look I liked. The first thing I did was crop the image down to eliminate some useless elements from the bottom. I then ran the image through a noise-reduction process because I the 250 ISO on my Olympus E-3 introduced a little bit of noise, and I knew that subsequent processing would probably increase that noise so I wanted to have as clean of an image as I could to start with. I then used Topaz Adjust to bring out some of the details in the floor and decorative elements. In Silver Efex Pro I increased the structure of the entire image and selected the Panatomic X ISO 32 film preset to get a conversion that I liked. I added a bit of tinting as well. Finally, in Lightroom, I applied a different tint as well as added a slight vignette. Compare the finished image to the image I started with below. Copyright © 2008-2010 James W. Howe – All rights reserved. You’re on a real winning streak at the moment – this is another great shot! Feel like I’ve gone back in time!